Founded in 1924 in Osaka, Japan, Daikin has a century of history in creating global air conditioning solutions with innovative technologies and products that have ensured a comfortable and sustainable living environment for millions of people across many regions of the world. Today, Daikin products are used in more than 145 countries worldwide. There’s more to feel good about Daikin R32 Non Inverter Series; Ozone layer protection, economic feasibility and energy efficiency. • R410A as an alternative to R22 refrigerant because it is an ozone-friendly refrigerant. • R410A refrigerant has no chlorine content which do not contribute to the depletion of the ozone layer. • R410A is of zero ozone depletion potential (ODP=0). • FTN-P Series : The beautiful and clean design brings out a feeling of elegance and simplicity in your interior decoration. ● It encourages condensation of water. The condensated water moves easily to the drain pan thus enhancing the cleanliness and lifespan of the cooling coil. ● The new Lambda (λ) structure with a large surface area makes way for higher heat exchange efficiency. ● Aesthetically designed to complement any interior comfortably. ● Once power resumes after a blackout, the unit will restart automatically at its last setting condition. ● Protect air conditioner from overcurrent condition. ● This will prolong the unit's lifespan as the unit will be protected. 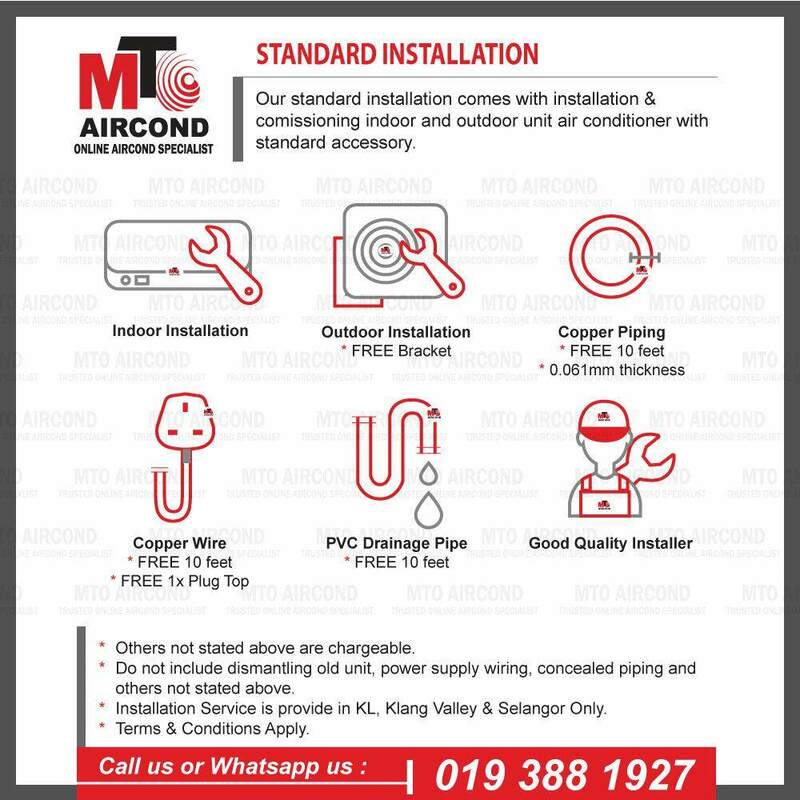 We do provide installation service, Kindly contact us to arrange the appointment for the installation.